Thank you for your interest in the District 35 Toastmasters Ambassador Program (TAP). The time frame for the 2018-19 District TAP is from July 1, 2018 – April 30, 2019. The TAP encourages visits to other clubs and events in the district and rewards the member’s growth through this exploration experience. It also recognizes best practices reported across the District. WHAT WILL YOU, THE AMBASSADOR, GAIN? New ideas to bring back to and rejuvenate your home club. Confidence from speaking in front of unfamiliar audience. The satisfaction of helping in a functionary role (if asked). New contacts and meaningful connections to promote your personal growth! The greatest reward for you is the experience! New ideas and energy from the ambassador. The ambassador may be interested in a “dual membership” in the visited club. More knowledge and confidence for the existing club members. Advertise on your website or club page that you are welcoming Club Ambassadors! HOW DO I BECOME A DISTRICT 35 TOASTMASTERS AMBASSADOR? FIRST: Between July 1, 2018 and April 30, 2019, visit any club in which you are NOT a member OR attend any District, Division, or Area contest, officer training, or conference. Visit as many clubs and events as you can to get a variety of ideas, different contributions, and diverse experiences from those Toastmasters Clubs and District events. NOTE: Only the first visit to any club will be counted as an Ambassador visit. SECOND: Have fun at the meeting or event as you observe, take notes, and promote the TAP. Pick any club you haven’t visited (can be within District 35 or any other District). Contact the club to confirm it is meeting on the published date/time/location. Offer to be assigned a role, to be a guest speaker, and/or included in the meeting agenda or if not needed, let them know you just want to visit, observe, and have fun. Visit the club during a regular meeting or a scheduled Area, Division, or District event. Announce yourself as an Ambassador, promote the TAP and its benefits, and encourage others to participate in the Ambassador Program. Observe the meeting details, participate, and take note of the practices you admired the most and best practices you would take back to your own club. List the observed best practices and what you would like to implement in your own club or your personal development. Visit more clubs! Visit more District/Division/Area events! Above all, have fun exploring different venues! Each time you visit a club or District/Division/Area event and you submit your Ambassador Report you will be credited with an Official District 35 Toastmasters Ambassador visit. If you complete a total of 3-5 club visits and/or District events, you will be recognized at the Spring Convention with a Blue Ambassador Award. If you complete a total of 6-10 club visits and/or District events, you will be recognized at the Spring Convention with a Red Ambassador Award. If you complete a total of 11-15 club visits and/or District events, you will be recognized at the Spring Convention with a Silver Ambassador Award. If you complete a total of 16+ club visits and/or District events, you will be recognized at the Spring Convention with a Gold Ambassador Award. How to find a club? Go to www.toastmasters.org and visit “Find A Club” to locate clubs that fit into your schedule. How to find a District / Division / Area event? 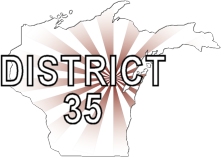 Go to https://district35.org/events/ and look through the district calendar for event information. Contact Club Growth Director Kris Pool, DTM with questions. 920-698-0656 or Kris.Pool.DTM@gmail.com. Please give us your feedback about the club and/or district/division/area event you visited between July 1, 2018 and April 30, 2019. Area and/or Division Directors must attend events outside their respective area/division. Remaining district officers, except for the Trio, are eligible to participate. Any member that has completed and submitted the Club Ambassador form that was available on the district website up until September 15, 2018 will have that visit(s) count towards the new TAP. Any event visits after September 15 must use the new form.